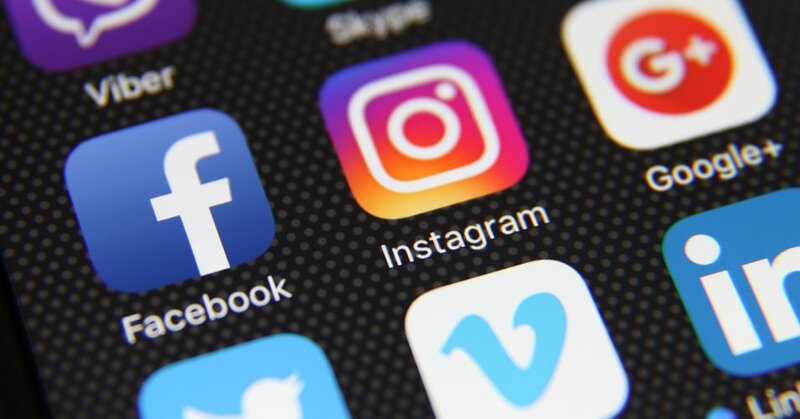 Several Midwestern states experienced severe flooding in March following a wet winter, spring thaw, and the infamous “bomb cyclone”. This storm dumped snow and rain throughout the Midwest, causing unprecedented flooding, particularly in Nebraska. 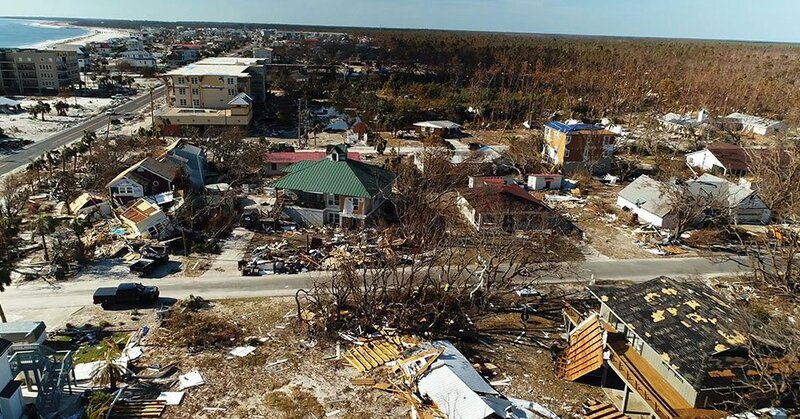 By the end of March, this region already suffered approximately $3 billion in damages and at least three deaths. Levees were breached causing evacuations along the Missouri River, the roads became impassible in the South Dakota Pine Ridge Indian Reservation trapping residents for two weeks, and the State of Nebraska alone experienced over $600 million in damages. On March 21st, President Trump signed a disaster declaration providing individual assistance to 9 counties and public assistance to an additional 65 counties and 5 tribal nations within Nebraska. Nebraska waterways, including the Mississippi River and the Red River of the North, are soaked with precipitation levels at 200% above normal. Rapid snowmelt, heavy spring rains, and ice jams led to a massive, destructive rise in water levels. Unfortunately, it is predicted that this spring will continue to bring rainstorms and flooding that will exacerbate the problems in an already soaked region. 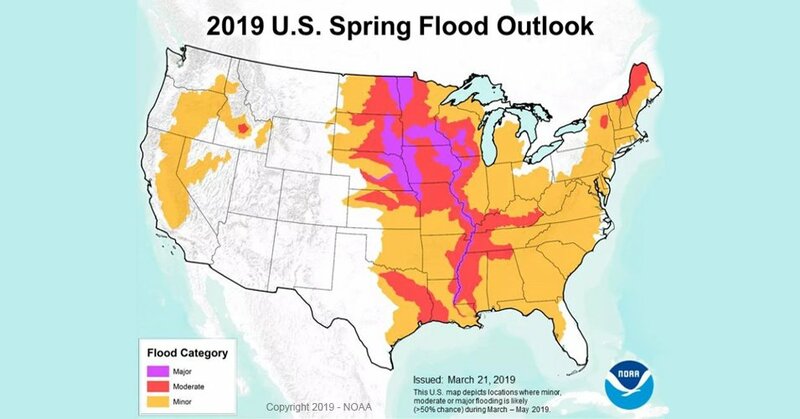 NOAA’s spring outlook for the central United States indicates that extensive flooding is likely to continue through May. As water flows downstream, the flooding will get worse. This puts approximately 200 million people at risk for flooding in their communities. Most of the storms are projected to occur in the southern half of the nation, bringing heavy rain. In the northern reaches of the Midwest, flooding will continue to be driven by spring thaw and ice jams. Periods of warmth combined with heavy rain will likely lead to major flooding. Rivers will remain at or above flood stage for many weeks. If your community is at risk for flooding this spring, review and remember these guidelines provided by the Nebraska Emergency Management Agency. If there is a chance of flash flooding, move immediately to higher ground and avoid areas subject to flooding. Flash floods are the number one cause of weather-related deaths in the U.S.! If floodwaters rise around your vehicle but the water is not moving, abandon the vehicle and move to higher ground. Do not leave a vehicle and enter into moving water. Flood Warning = Take Action. Flooding is either happening or will happen shortly. 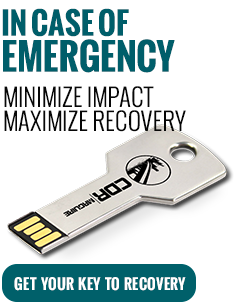 I encourage you to download our “Key to Recovery” guide to prepare for, mitigate against, respond to and recover from any disaster.